It's a miracle! I'm back with a new blog post! 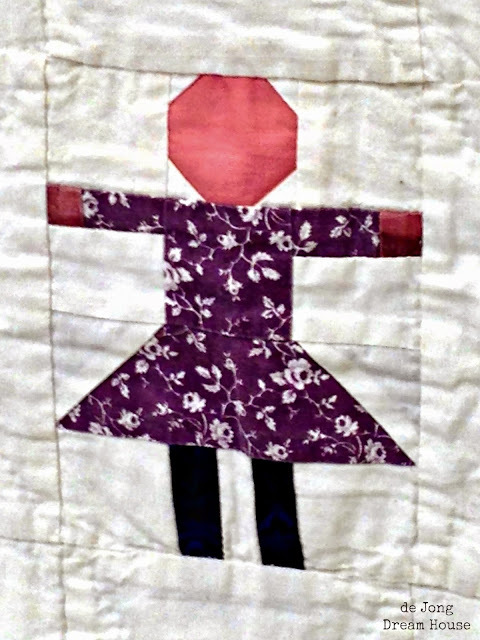 I made this little people quilt for my son's school. I've had several inquiries into how I made it. And since I didn't want to forget, I'm writing it all down for our mutual benefit! A few fun facts. 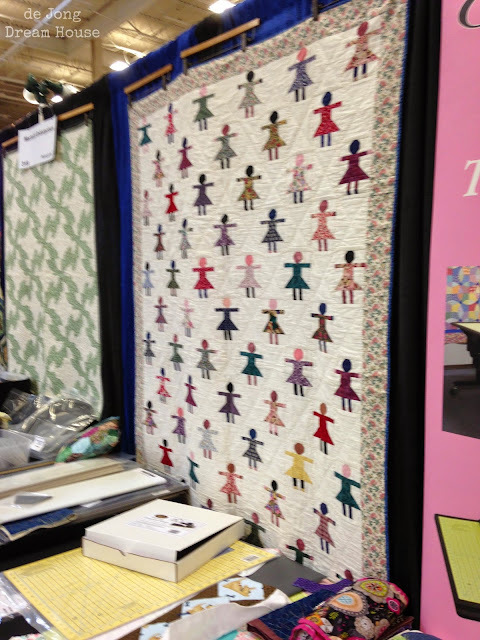 This quilt is made of 622 individual pieces (yes, I counted! ), 63 different fabrics (I raided my scrap bin), and 19 different colors of thread! About a month ago, I finally got around to re-creating the block pattern. (If anyone knows what it is called, please let me know in the comments). The people on the quilt I saw were pretty small, maybe 5"x7". 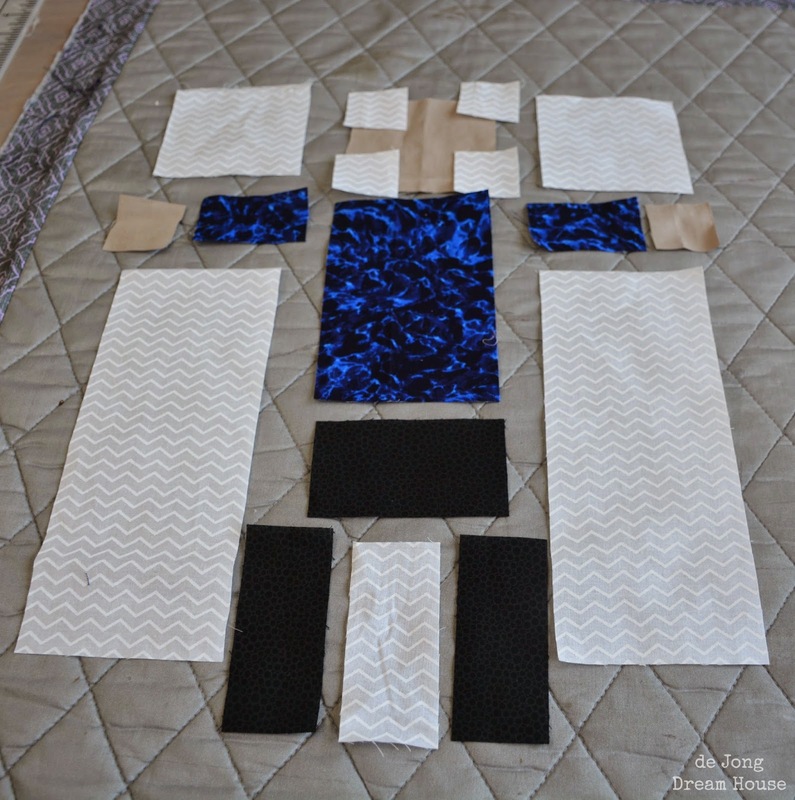 When I decided to make a quilt with these blocks for my son's school, I decided to make them a little larger so that I could have a little fun with their outfits. My blocks were 9.5" x 12.5." Despite making 18 of these blocks, I had to make two additional ones for this post because I never took photos of the process, mostly because I made a mistake on every one! I'm glad I did, because my notes weren't correct. 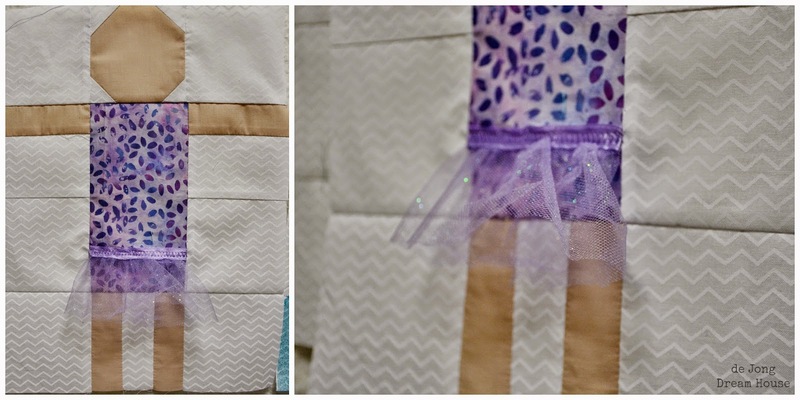 Now both you and I will be able to make these cute blocks without wasting fabric! So, we'll start with the boy, because he's a little easier. After you cut out the pieces, I like to lay them out to make sure I have all the pieces. The head is the most complicated step, it took me a few times to figure out the right proportions. This is a good time to note that if I were to make this quilt again, I would choose a white pattern that didn't have a direction to it. That would have saved a lot of time and fabric, as some pieces needed to be cut a certain way. 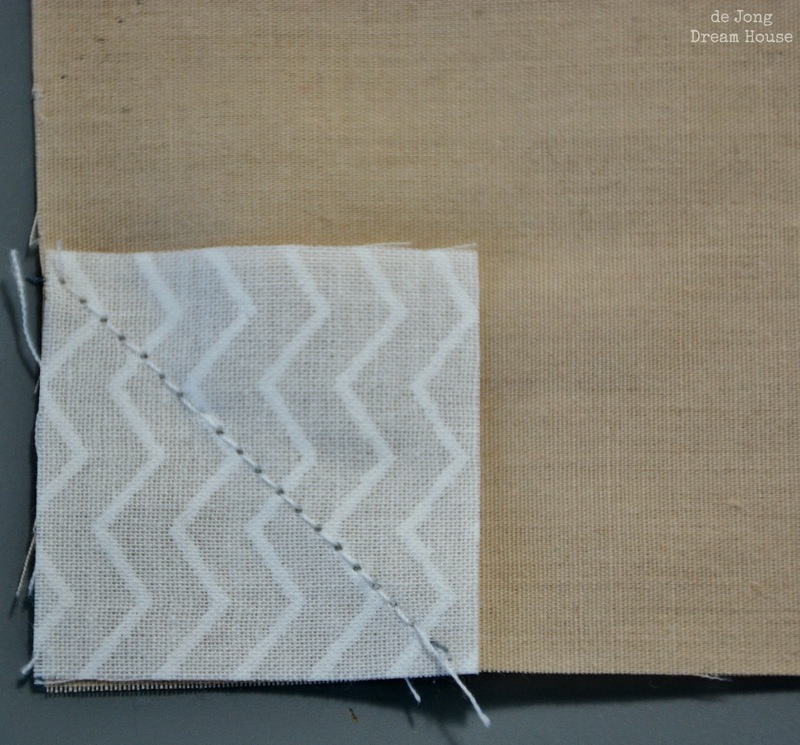 First, take one of your little .75" squares and place it in the corner of your skin tone square. 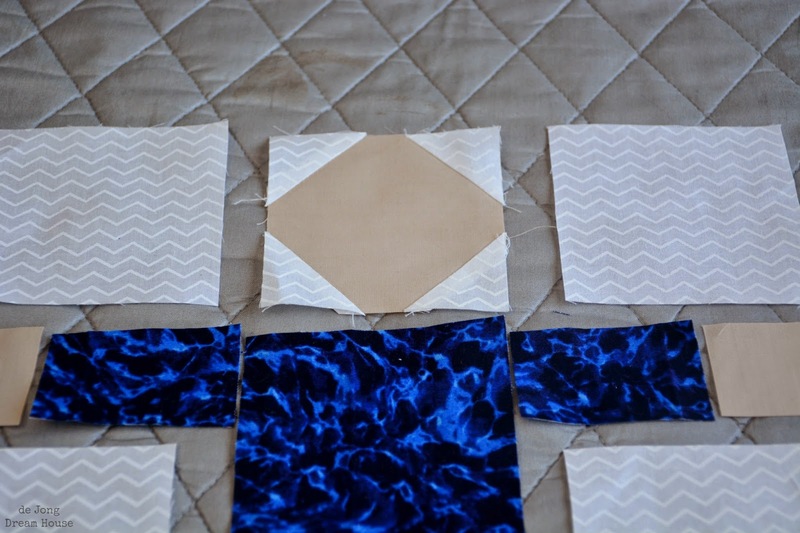 I used four different skin tones in my quilt. Because the piece is so small, I didn't draw a diagonal line or pin the pieces together. 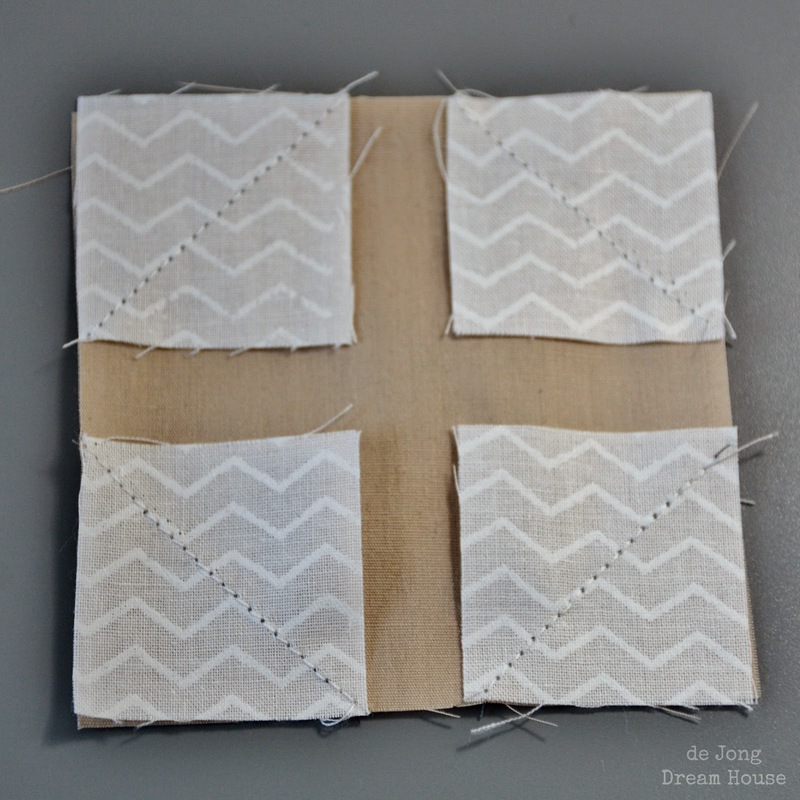 Just sew from one corner of the white square to the opposite corner. Repeat with the other three white squares. Again, if you are using a background with a directional pattern, make sure that all pieces are placed in the right direction. 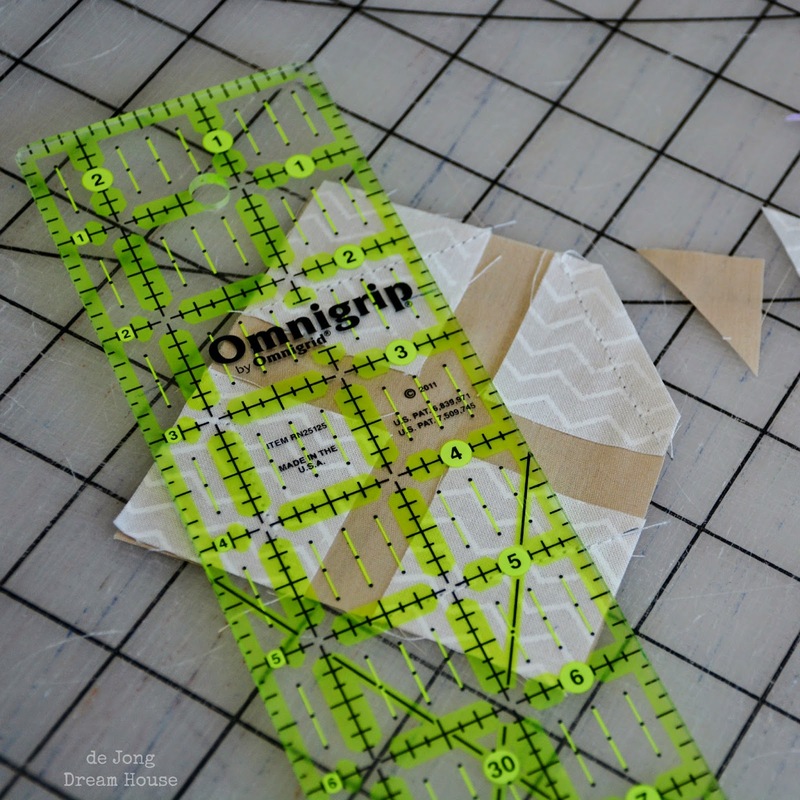 Use your ruler to mark a 1/4" and trim the excess. It looks a little angular at this point, but it will look better when it's all pieced together. ***Note*** The photos here show a 1" square. In the actual quilt I made, I used .75" squares. Assemble the rest of the pieces as shown. 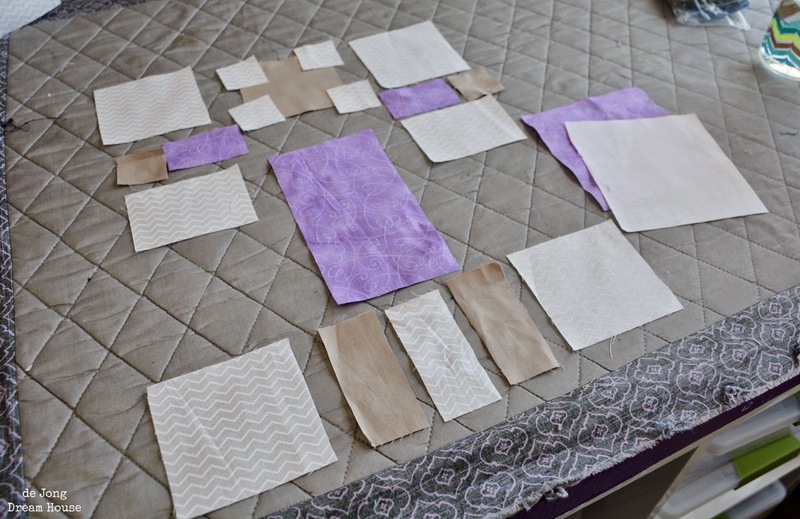 When I was making the actual quilt, I chain-pieced, but here you can see each step. The main difference between the girl block and the boy block is the dress. 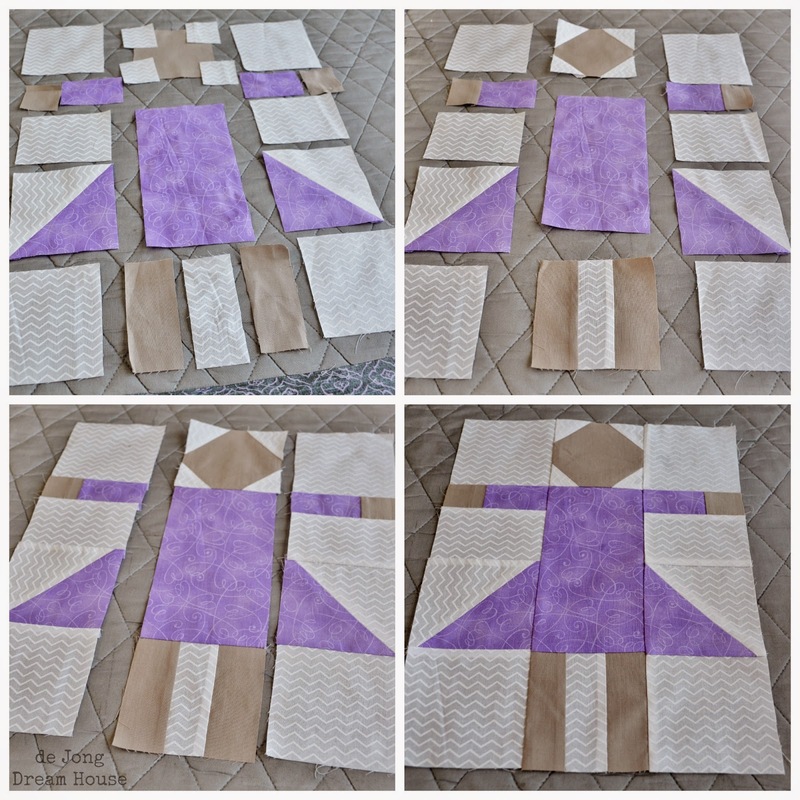 As you can see in the finished quilt photo, I varied from this design a bit with the ballerina, tree hugger, and Elsa blocks. 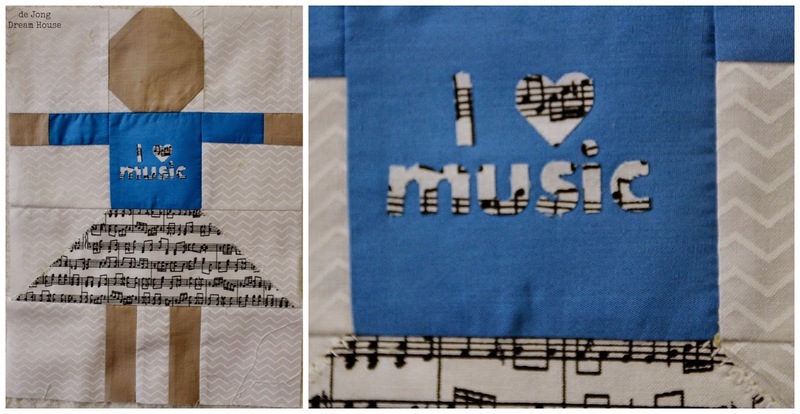 One the music lover block, I actually appliqued her skirt so that the music would run across her skirt. 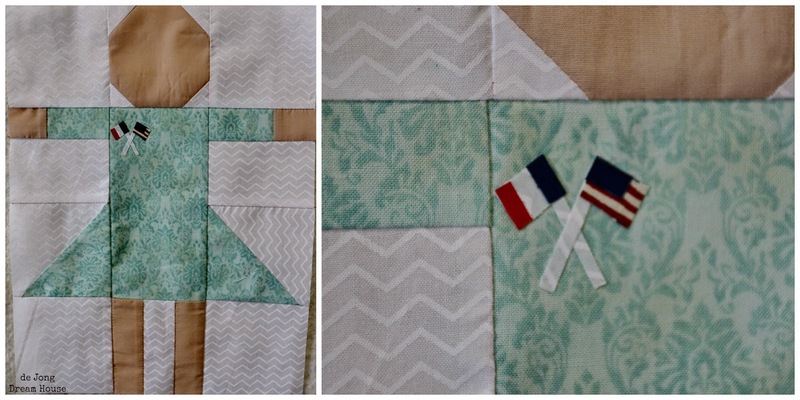 Much of the fun for this quilt for me was customizing each block. That said, here's the basic pattern for the girl block. First, lay out your pieces. At this point, I hadn't yet created the half square triangles for the skirt. I always seem to need larger squares than the expert quilters recommend, so I used 5" squares to create 3.5" HST. If your lines are better than mine, you may be able to use 4" squares. If I were to make this quilt again (i.e., had I not already cut a ton of 5" squares, I would have split the difference with 4.5" squares). 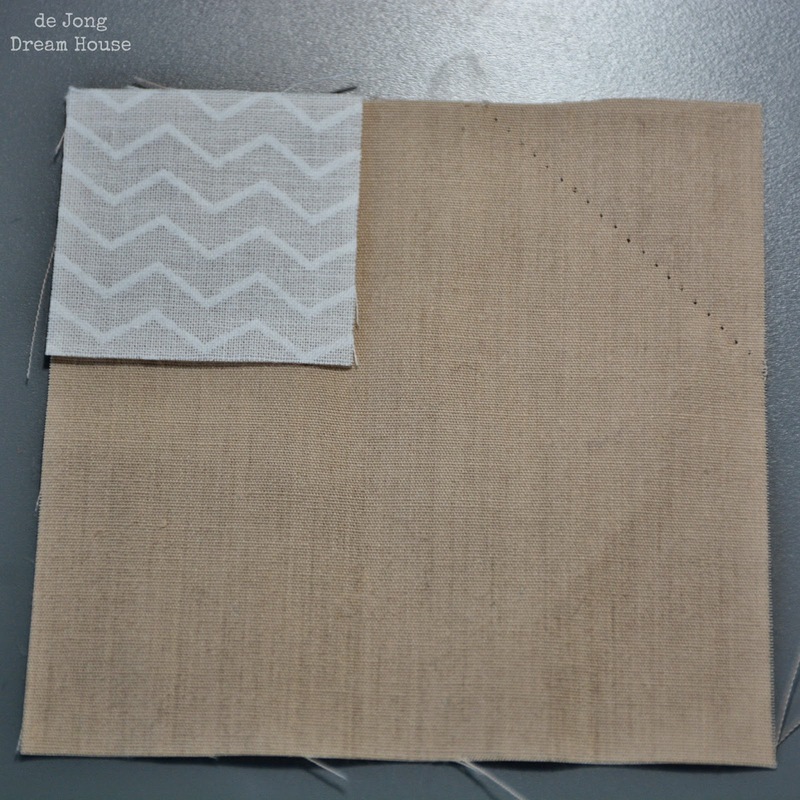 Once the skirt pieces are made, follow the same instructions as the little boy block. Here are some close-ups of a few of my favorites. Superman was a big hit with the students. I put my Silhouette Cameo to good use on this quilt. 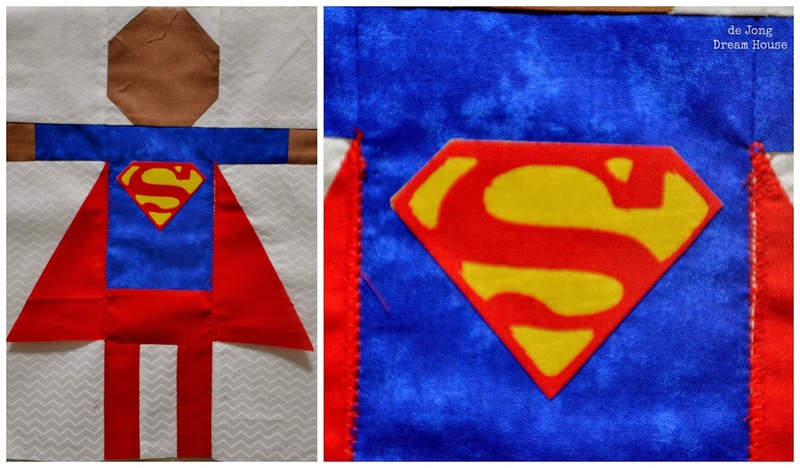 I'm still figuring out how to break apart images for applique, so that little S took WAY more time than it should have. On the plus side, I could make another in 10 minutes! The artist is an example of how much more complicated my people got as I got into the project. This block was originally a simple girl in a yellow dress. I made a straight line skirt, but didn't like it, so I took apart the block and made the traditional yellow block. Then I had the idea to add the palette. You can see how tiny the pieces were! While I was making this quilt, we had a French teacher staying with us for a month while she observed at our son's school. Sandy's favorite color is green, so I chose this fabric to represent her. To give perspective on the size of the flags, the arm to the left is 1". The inspiration for the ballerina came when I was at Joann looking at ribbon. D's school has new performing arts teacher who has taught my boy to dance (! ), so I wanted to honor Miss J. 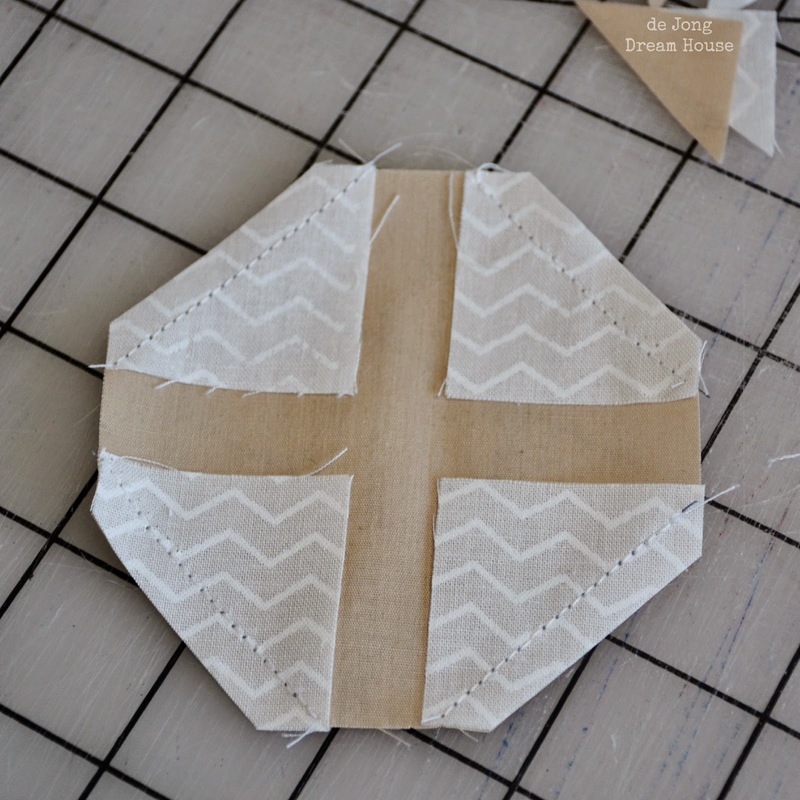 You can tell that this is one of my earlier blocks because it was made before I realized it would be much easier to make one long white side pieces instead of three smaller pieces. The musician was my practice run for the letters I would need for the school name and tagline. And here are close ups of some of the others. Once the blocks were done, I was able to figure out what size the middle section needed to be: 36.5" x 36.5"
In part two, I will show how I made the the applique logo and tagline. What a sweet quilt! The kids will love it!!! Jen I'm soooo inpsired by this one!!! 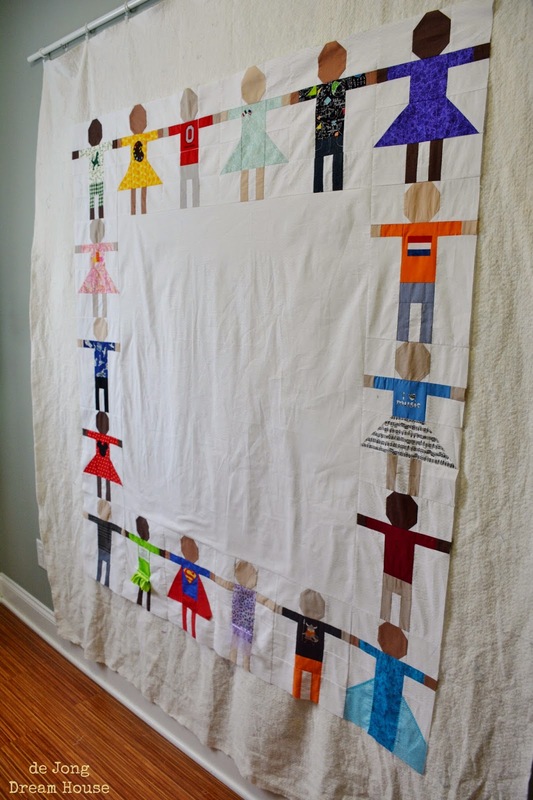 ANother great idea for me to create for a classroom quilt!! 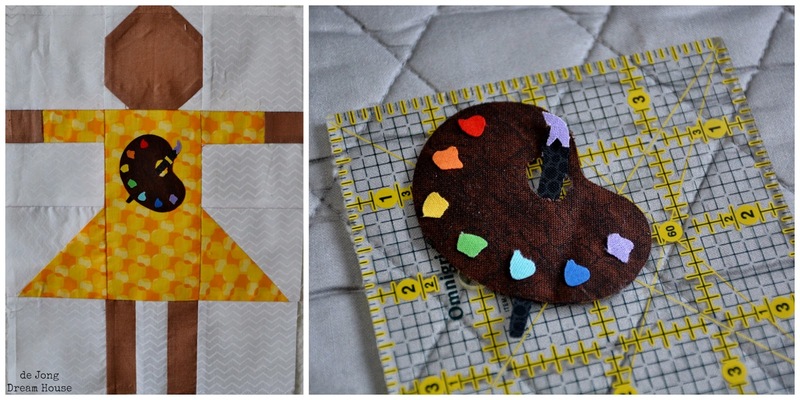 How fun would it be to have your students pick out fabric and themes for their blocks! You could auction it off as as a fundraiser! 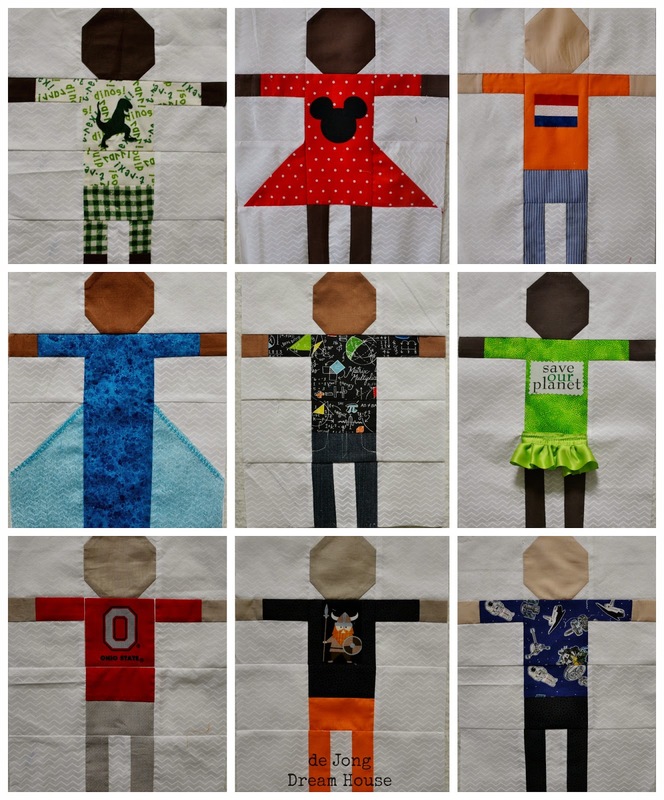 I love your idea of letting students pick out their fabric and themed person...it would make a great fundraiser!! What an amazing quilt. Your ideas are adorable and it must have been fun to make. 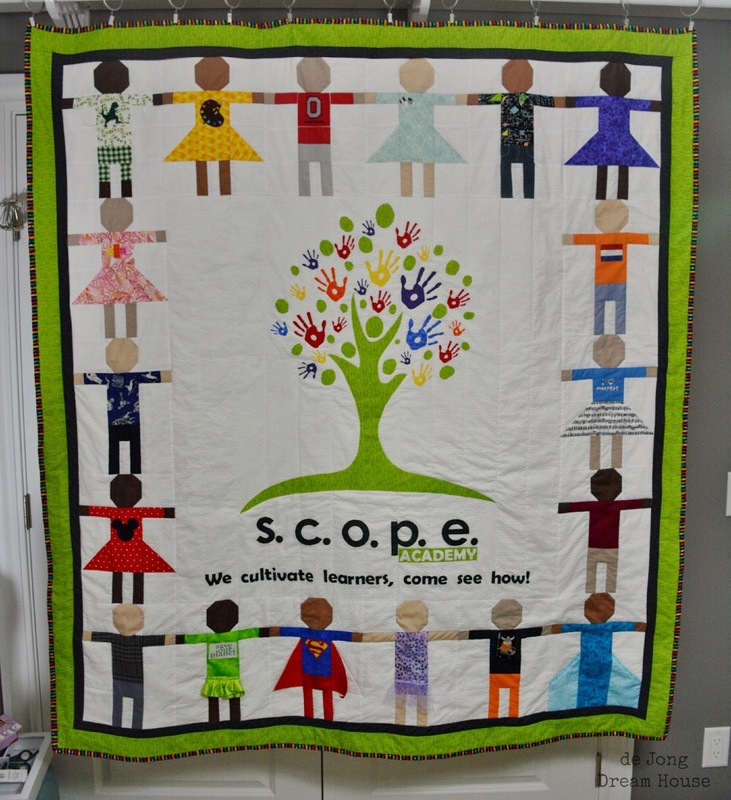 Such a wonderful quilt! Love all those little touches you added. Thanks for sharing!